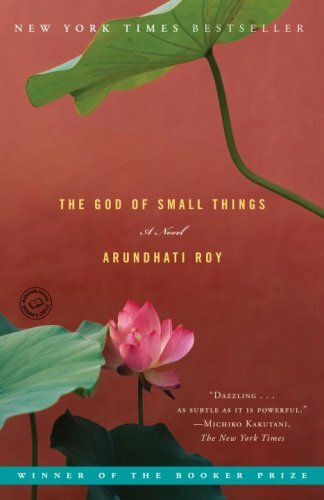 The God of Small Things is Serious Literature. I remember I had a copy of it a long time ago, maybe in college, and eventually traded it in at a used bookstore. I’d read a little bit of it, but I wasn’t ready for it yet. I’m glad I rediscovered it this year. Books find us when we’re ready for them, don’t they? I’ve noticed over the years that reading is something I continue to get better at, a fact both exciting and a little surprising to me. I don’t remember a time when I couldn’t read. Being a reader is a huge part of my identity, but after you’ve done something for so many years, you expect to reach a plateau, you know? Especially now that school is over for me, I have my degree, I’m not reading in a classroom anymore at the direction of an instructor—I wouldn’t expect my reading ability to continue to grow. But this book is proof that I’m getting better all the time. Prose that before felt too dense resonates with me now. A timeline that shifts and stretches and folds back on itself elicits suspense instead of frustration. And this is what I’m perhaps most proud of: characters whose culture was so foreign to me just a few years ago feel immediately recognizable. It’s entirely possible that I’m not a more skilled reader than I was in years past; maybe I’m just more empathetic now. More aware of my own frail humanity and willing to identify with the humanity in others. The God of Small Things is about Estha and Rahel, fraternal twins, brother and sister, born in India to a mother and father whose relationship would not stand the test of time. Their cousin and aunt are visiting from England, and Something Goes Very Wrong. (I keep feeling compelled to use Capital Letters, because this book is about Big Themes and Profound Feelings.) Roy brings a lot more than just a compelling story, however. She plays with language in a highly unique way, capturing the singsong, playful way Estha and Rahel speak to each other as children. Their common language permeates the book just as it permeates their lives, shattered forever by a string of irrevocable events. I’m glad I gave this book another try. Here’s to getting better with age. TagsA Touch of Melancholy, Abandonment Issues, Challenge Yourself, Choices With Far-Reaching Consequences, Cultural Enrichment, Feeling Big Feelings, Mamas and Papas, Mysterious Deaths, Nonlinear Storytelling, Sumptuously Gorgeous Prose, They're Twins!